We spent this past weekend in Ogunquit, Maine with Dale’s sister Lisa. She has a time share up there for the weekend and was really sweet to invite us to spend some time with her. The place was very nice and had some great features like a whirlpool tub and electric fireplace. Unfortunately, the weather was crappy. It rained Friday night and all day Saturday. Sunday was sunny but cold and windy. Of course the weather didn’t stop us from getting out a bit and exploring. We drove up the coast and I took some photos. They sure are different than the last beach photos I posted. We visited L.L. Bean, where I did some Christmas shopping. We played games and drank some wine. We shared stories and shed a few tears of the very recent death of Lisa’s boyfriend. We swam in the pool and took a turn in the sauna. Mostly, though, we just talked and laughed. And that always makes for a great weekend. So interesting how the ocean looks like it’s getting really for winter! I thought you might be away over the weekend — welcome home! I’m guessing you stayed in the car for those photos. Looks cold! The beach looks cold and wet, but still beautiful. It was a cold and dreary weekend around here; I’m glad you still had a good time. Wow! I’m cold just looking at those photos! Still sounds like a good weekend though. Do you know I visited Ogunquit in November and walked along the beach (such as it is) and saw much the same thing you did. Sounds like a nice relaxing and enjoyable weekend despite the weather. What beautiful shots! The ocean has definite personality. The sea looks like a churning cauldron! Nice that you got to get away! So sorry to hear about the death of Lisa’s boyfriend. That first photo of the waves is awesome. It makes me wish I lived by the ocean. I dunno, that looks like perfect whirlpool tub weather. Sorry to hear about Lisa’s boyfriend. I so love the ocean in the winter…..beautiful pictures! Beautiful photos. The ocean really does have multiple personalities. It sounds like you had a full weekend. I’m sorry to hear about Lisa’s boyfriend. THAT is my all-time favorite beach in Maine. We used to dash up from Beverly if we had a (very rare) weekend off from work. My first real boyfriend and I, and a couple of friends, spent a LOT of time on that beach. Glad you had a good weekend. Even if the weather wasn’t perfect. God, I love Maine. Looks like Scotland. Wild and gorgeous. The Atlantic in winter is beautiful. I hope your weekend was restful and rejuvenating, even if it wasn’t sunny! oh, i’m so sorry to hear about lisa’s boyfriend. what a sad loss. i’m sure she was grateful to have you there with her. overall though, it sounds like you had a nice and relaxing time. Sorry about the sadness, but glad you could all be together. The ocean is magical, isn’t it? Sounds like the timeshare was the perfect place to be in that weather. All that and LL Bean, too…what a weekend! I was raised in that area and love it! You must have gone to Perkins Cove as well. Lots of great food there. Even in crappy weather, I love Maine. Fortunately, I’m only 4 hours away. A beach, any beach, is where my heart calls me. I’m glad Lisa has you two in her life and I’ll bet she is too. 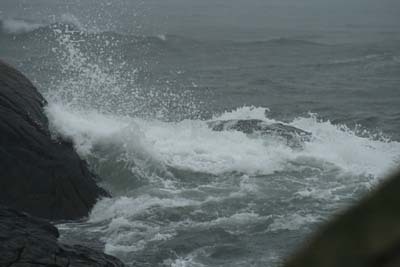 The Maine ocean is always gorgeous no matter how lousy the weather. Wish I could do that. I’m glad you had such a great weekend! So sorry about Lisa’s boyfriend. It sounds like a nice, relaxing, weekend. Those are the best weekends! Despite the weather, you took some fabulous beach shots. They are so moving. I’m so glad you and Dale were able to go spend the weekend with Lisa. I’m sure she enjoyed having you both with her. So sorry to hear about Lisa’s boyfriend. The beach is gorgeous no matter what time of year, isn’t it! Sounds like a nice weekend. 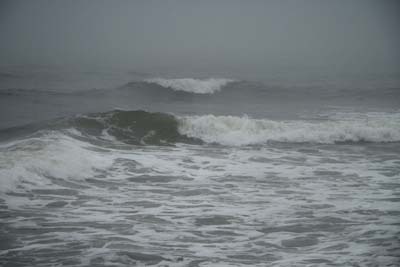 I enjoy seeing the ocean in bad weather almost as much as in good. It can be so much more interesting (especially from inside a house or car, warm and dry!). lenses do you have. I am in the market for a new one. We LOVE Maine!!! We go there for a week in a half every summer. I love the ocean in the wintertime – so powerful and beautiful. Sorry the weather was crappy, but it sounds like you had a great time. Those pictures are making me cold. Last time I was in Ogunquit was in an August. Don’t go there in August. The natives will thank you for waiting! The pictures are still beautiful and the idea of a weekend away (not involving a wrestling tournament) is just wonderful. It might not be swimming weather, but it sure is pretty! love love love those ocean shots.